Here, then, is the eighteenth instalment of the story of how Mary Jones and Thomas Charles triggered a mission to the world. The Society’s Monthly Reporter for May 1882 announced that William Jones had travelled to Bala to secure Mary Jones’s personal Bible for the Society. This Bible was displayed for many years at London Bible House and later went to Cambridge University Library where it remains in a magnificent new binding. In the same year, the Society published The Story of Mary Jones and her Bible “Collected from the best materials and re-told by M E R” – the first time the story had been published at length in English. The author was Mary Emily Ropes who had written many children’s books and was sister of the librettist Arthur Reed Ropes. 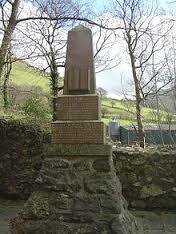 In 1907, at the ruins of the cottage at Tyn’y-ddôl where Mary spent her childhood and set out for her walk to Bala, Merioneth Sunday Schools erected a monument which, to this day, is well cared for. Merionethshire has since become Gwynedd. (She was actually in her sixteenth year but hadn’t reached her sixteenth birthday when she walked to Bala.) In October of the same year, Lizzie Rowlands enthralled the children of the Band of Hope, Llidiarde, with a talk recalling her visits to the elderly Mary Jones in the last two years of her life. In the early 1930s, some publicity was given to an assertion by Bob Owen of Croesor, a colourful and eccentric Welsh writer and self-taught historian, that “there is no truth in the Mary Jones story”. He wrote, “It is said that Mary Jones’s Bible is in the office in London. No doubt she had a Bible, but there is no certainty that there is any history to that Bible, any more than the thousands of other Bibles printed at that time to be sold in Wales.” However, Owen’s muddled statements were effectively answered by Dr John Owen of Morfa Nefyn who, in December 1936, published evidence which “proves conclusively the truth of Mary Jones’s story”. Even more evidence about Mary emerged later and we now know that it was John Owen who had the truth.